Okay lets get things back on track. How about a super tasty, super sweet, halloween candy recipe? 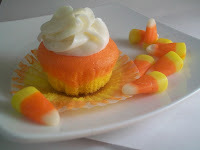 I have two different cupcake recipes for today's post. The first cupcake might be the most awesome looking cupcake I've seen thus far. The frosting (which I normally don't enjoy) looks PHENOMENAL! So super halloweeny... hehe I said weeny. But it's a long one, the recipe that is, but not very difficult if you read through it. It also has you making the cake batter from scratch. Feel free to not. The second recipe is super easy and great looking. Would be a fun treat for any Halloween party. 1. For the cupcakes: Adjust oven racks to the upper-middle and lower-middle positions and heat the oven to 350 degrees. 2. Line two 12-cup muffin tins with cupcake liners. 3. Whisk the milk, egg whites, and extracts together in a small bowl. 4. In a large bowl, whisk the flour, sugar, baking powder, and salt together. 5. Using an electric mixer on medium-low speed, beat the butter, one piece at a time, into the flour mixture, about 30 seconds. Continue to beat the mixture until it resembles moist crumbs, 1 to 3 minutes. 6. Beat in all but 1/2 cup of the milk mixture, then increase the mixer speed to medium and beat the batter until smooth, light, and fluffy, 1 to 3 minutes. Reduce the mixer speed to low and slowly beat in the remaining 1/2 cup of the milk mixture until the batter looks slightly curdled, about 15 seconds. 7. 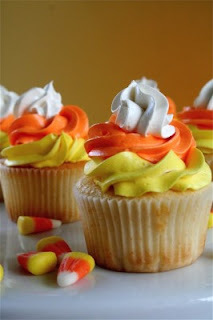 Use a greased 1/4 cup measuring cup to pour the batter evenly into the cupcake liners. 8. Bake the cupcakes, switching and rotating the pans halfway through baking, for a total of 15-20 minutes. (Mine took about 20 minutes total). 9. Let the cupcakes cool in the tins for 10 minutes, then transfer to a wire rack to cool completely. 10. For the frosting: Beat the butter, cream, vanilla, and salt together in a large bowl with an electric mixer on medium-high speed until smooth, 1 to 2 minutes. 11. Reduce the mixer speed to medium-low and slowly add the confectioners’ sugar, and beat until incorporated and smooth, 4 to 6 minutes. Increase the mixer speed to medium-high and beat until the frosting is light and fluffy, 5 to 10 minutes. 12. Divide the frosting into three bowls and tint each with desired food coloring tint. 13. Using your pastry bag and desired tip, pipe the frosting in a cone-shape on the cupcakes…and voila! Hey there! Thanks so much for the shoutout. Although I must say, my box mix recipe is a little sad compared to the yummy first recipe! Haha!